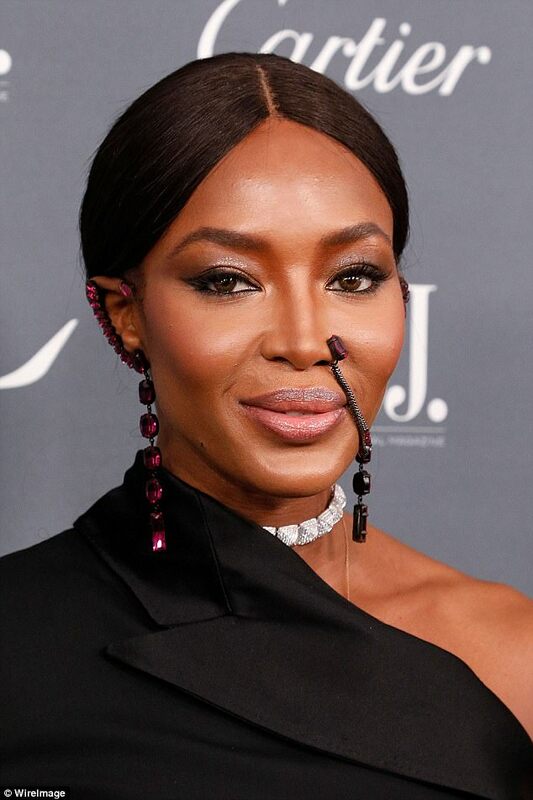 It’s highly likely Naomi Campbell is morphing into a fashion maverick or developing an unrivaled style for her herself. This is because a few days ago, the veteran model was pictured in a somewhat dramatic crown at the amfAR’s Fabulous Fund Fair and yesterday again, she attended the Innovator Awards wearing an unexpected jumpsuit. Campbell wore a very confusing ensemble which featured asymmetrically hemmed dress at one side and one-legged pant on the other side. As if that wasn’t enough, the black number also boasted an asymmetric neckline that effortlessly showed off her slender arm, where she adorned with a matching bangle. But in as much as her dress or her statement choker necklace plus the matching clutch bag demanded attention, it was her chain nose-earrings that have really got people talking. The jeweled chain is, of course, eccentric but stunning, especially the colorful brilliant stones. Naomi then completed the look with a pair of court heels and posing up a storm like a true supermodel. Keep scrolling to see more images.